Libretto by Jules-Henri Vernoy de Sant-George, Jean-Francois-Alfred Bayard. The problem with this sentimental opera is that the music and story sound derivative of Mozart’s comic masterpieces like Die Zauberflöte (The Magic Flute) and Le nozze di Figaro (The Marriage of Figaro). In his day, Donizetti, a prolific composer with 75 operas to his credit, often stole from his own works to create the next new work. 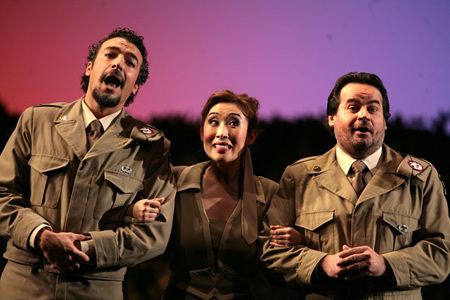 According to London-based critic Warwick Thompson writing for WNO’s Spring 2007 Season Book, Donizetti said that everything in Régiment was new. Thompson goes on to say that the regimental song “Chacun le sait” is similar to an aria in Donizetti’s earlier opera Il diluvio universale. The story of La Fille du Régiment concerns a girl who was abandoned on a battlefield and then rescued by a French regiment who all became her fathers. The timeline begins in her teenage years when she falls in love with a Swiss farmer who saves her life and also is identified by a Swiss Marquise who claims first that Marie is her niece and later that Marie is her daughter. Emilio Sagi has updated the story from Napoleonic wartime to just after the Germans have been routed from the French countryside in World War II. Stefania Bonfadelli, wearing the skirted uniform of a WWII woman soldier along with her antic interpretation of Marie, brings to mind the old Broadway star Mary Martin in her roles in Peter Pan and in the Rodgers and Hammerstein’s smash hit South Pacific. Historically, La Fille du Régiment and the role of Marie was a favorite opera of coloratura soprano Jenny Lind known as the “Swedish Nightingale.” Did Lind’s performances have that extra je ne sais quoi or was this kind of opera buffo just what people of Lind’s day loved? Overall this is a no frills production that, despite its updated timeline, offers nothing more imaginative like projections, wild costumes, or unusual props. One particularly telling moment for this reviewer occurs in the opening of Act II when the Marquise forces Marie to sing old classical music (is this from John Blow’s Venus and Adonis) and all Marie wants to do is to sing the songs of her beloved regiment. In La Fille du Régiment, depth always gives way to surface.